Noodles have been one of staple foods in many Asian countries since ancient time with lots of variety. 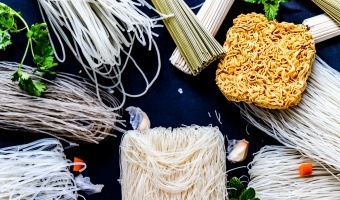 Read our guides with introduction to several common Asian noodles, their usage, handling technique plus our pick on some of the best distinctive flavor Asian noodle bowls. Enjoy your stay with delicious and easy recipes for those home cooked meals. Here are all our collection of originals, fusion or inspirational recipes. Don’t forget to check out our informative guides and reviews on foods & drink topics. Never Miss a Recipe or Guide! Some posts may contain affiliate links to useful items that deem their values to the recipes/guides. We are a participant of the Amazon Services LLC Associates Program, an affiliate advertising program designed to provide a means for sites to earn advertising fees by advertising and linking to Amazon.com.